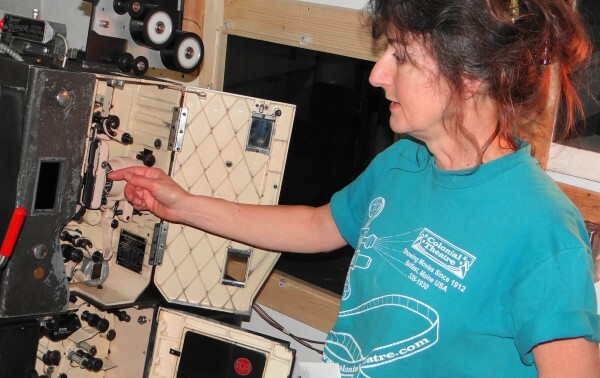 Therese Bagnardi, co-owner of the Colonial Theatre in Belfast, points to the insides of one of the 35-millimeter film projectors being replaced by digital equipment. 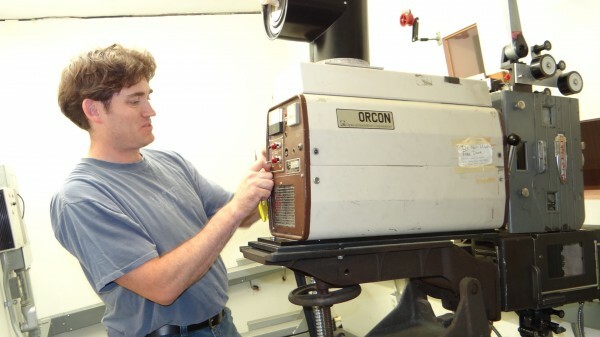 Will Martell works at dismantling one of the Colonial Theatre's 35-millimeter film projectors. BELFAST, Maine — The chirpy, whirring sound of a 35-millimeter film projector has been heard upstairs at the Colonial Theatre for 100 years. Therese Bagnardi, who owns the landmark movie house with her husband Mike Hurley, knew she would miss that sound when the theater’s projectors were replaced this week with digital equipment. So she made an audio recording of the rugged old machines. “We actually recorded the sound, so we don’t get lonesome here in the booth,” she said. The theater also is keeping one of the film projectors for history’s — or nostalgia’s — sake. Whether projectionists play the recording when the soft, sighing sound of the digital equipment is in use Friday, when “Brave” and “The Best Exotic Marigold Hotel” debut digitally, is an open question. Bagnardi and some of the projectionists who have worked at the Colonial since the Belfast couple took ownership of the venerable theater in 1995 are nostalgic about the end of film. It’s a change forced on them by the film industry. For film companies, using digital versions of movies instead of making and shipping 35 millimeter prints to movie houses is a lot less costly. But for independently owned theaters like the Colonial, buying and installing the digital projection equipment is a big ticket conversion. Bagnardi said the cost will be close to $180,000. But by next year, new releases will not be distributed in film format, so the business had little choice. “It’s extensive and expensive,” Bagnardi said of the change. Last year, with the pending industry switch to digital looming, she and Hurley discussed their options, which included closing or selling the theater. Instead, they took the plunge into the digital age. The Colonial is reaching out to patrons and supporters, hoping they will help underwrite the switchover to digital through a Friends of the Colonial Theatre group. A series of perks will be given at various levels of donation, from $10 to $100 and $1,000. Though it is a for-profit business, the theater has enjoyed community support since the couple renovated and expanded it, restoring its art deco glory. The Colonial is an active player in the community, hosting music festivals, vaudeville revues, New Year’s By-The-Bay events and providing free movies for kids at Christmas. Last weekend, Bagnardi and Hurley gathered about a dozen current and former projectionists and toasted the old equipment with champagne. Monday morning, a crew was at work dismantling the Brenkert projectors in the projection booth that serves the City and Star screens, and in the booth that serves the Dreamland screen. The Brenkerts were installed in 1947. Also removed were round steel platters, about four feet across, designed to take up the film after it passes through the projector. Some films, when stretched out, measure 3-4 miles, so handling the spooling celluloid correctly is critical. New screens also were required, adding to the expense. Wil Martell, who works in the IT department at Maine Maritime Academy in Castine but lives in Belfast, wanted to be a projectionist since he was a teen. Two years ago, his wife pointed out that the Colonial was hiring projectionists, so he happily applied. “This is my summer fling,” Martell said, as he carefully took apart one of the Brenkerts. “It’s old and it’s been running for a long time,” he said with the same air of appreciation a car fan might exhibit over a 1959 Corvette. Though the Colonial won’t offer 3D films, the digital equipment gives the theater possibilities, such as airing live Broadway plays and the Metropolitan Opera from New York. The new screens will reproduce images better, and the sound will be improved. For more information about the Friends of the Colonial Theatre, visit www.colonialtheatre.com.